A force to match the power of nature and the sea. The new V6 DF350A boasts a 4.4 litre displacement, making it the largest displacement V6 on the market. This new technology provides more grip underwater and because the contra-rotating propellers distribute the engine torque more evenly over the two propellers the torque per propeller decreases and gear diameter can be reduced. The Dual Louver System incorporate a double shield of blades – each one designed in a dog-led shape and results in eliminating water intake, even in the face of the most severe on the water testing. The outer blades removes the spray and drains the mist resulting in the intake air temperature being free of moisture and no higher than 10° above ambient. An ergonomic case design adds to the outboards computational fluid dynamics designed to and development to minimize resistance and provide the most efficient flow of water to the propellers. 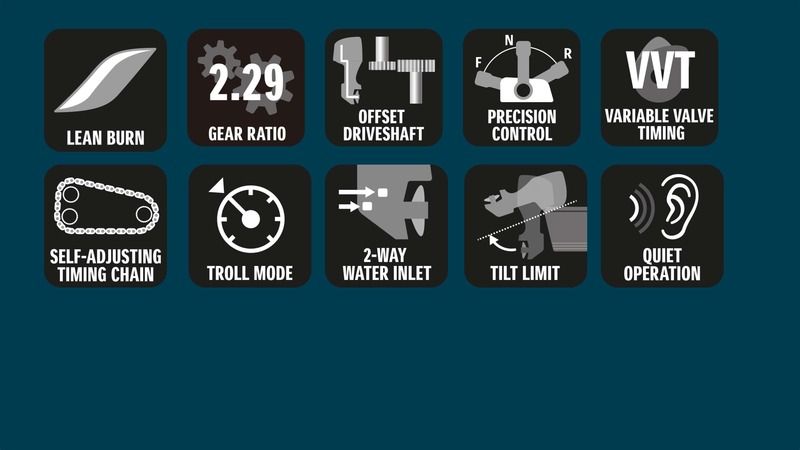 The offset drive allows us to make our outboard engines smaller by moving the outboards centre of gravity forward, improving weight distribution, power output, balance and reduces vibration. Suzuki Motor Corporation’s new flagship four-stroke outboard motor, the DF350A, has received the National Marine Manufactures Association’s (NMMA) 2017 IBEX Innovation Award for outboard motors at the International Boat Builder’s Exhibition & Conference (IBEX).